Badass Fatass: What does the Ursula Doll mean to you, fatties? Essentially, when I think of the positives related to an Ursula doll (and not any of the sizable negatives related to Disney's long history of cultural appropriation/oppression), I think of how excellent it is that there is finally (kinda) a Divine doll! Divine means so much to me personally, and so much to the way I navigate life as a fat queer and trans person interested in gender performance. 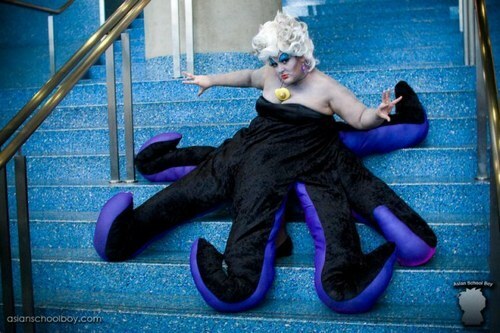 In my world, though, Ursula -- that hot, smirking, strutting queen of sultry femininity -- lives forever. OK, first of all, WANT! I want an Ursula doll for my desk at work, because she'll remind me to stop apologizing for no reason all the damn time and I could squeeze her when I'm stressed! Second of all, Ursula was based on Divine? Hooo-LEE awesome. I learn cool new stuff every day on the intertoobz!